Nandi Hills is in Western Kenya and only a two hour drive from Kisumu and from Kericho and Eldoret. Placed high up in the hills you find Nandi Hills with it's fabulous tea farms. A visit in this magic area is a must and will make you fully appreciate the beauties of Kenya. A spectacular scenery. some photos please. True!! Nandi Hills is a magnificent place to be. While visiting this area make Kip's Eco Resort your temporary home, it is a small tea farm transformed into cozy and comfortable lodge. A natural and relaxing place where you leave the travel stress behind and enjoy the everyday things in life here. We promote agro tourism and our farm is one of the demonstration centres- You can pick your own tea leaves, experience the process of drying in a nearby tea factory and the next day you enjoy your self-picked tea. ..Nandi hills tea plantations is a great place to visit and if possible spend a day or two to learn more about Tea ..from the tea nursery , planting , maintaining tea tables (the green carpet ), plaucking , pruning and finally a visit to the Tea Factory itself to see the end product . I spend 11 years in one of the Tea companies in Nandi hills and the evenings while taking a walk in the tea farms left me with great memories .. Dawn In Africa Safaris. nandi hills has beautiful tea plantations. a place to be, especially, if you wanna feel nandi huts, go to Kips' eco resort. if you wanna feel, the true taste of kenyan tea, buy nandi tea, at the factory, or better still, make your order through me. Judy. 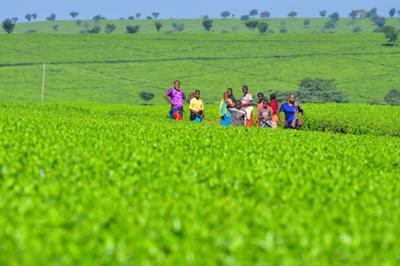 Kindly photograph mbogo valley tea farms in Tinderet. The place is spectacular. My brother in law works for Unilever, formerly Brooke Bond and we have done the tour there twice with our kids. It is very beautiful and the boys were very pleased with the big machines in the factory. Also, had lunch at the Tea Hotel in Kericho, which was fun. A good day trip for a Kenyan or Kenya based family as well as foreign tourists. WOW, Andy, this looks amazing!!! Never been there, only drove through there very fast one day. I can see it is absolutely worth a visit! Always wanted to spend a few days in that area and visit one of these tea farms and see how they operate and how tea is being made. Spending a weekend out of the city sounds like just the thing and if you're pressed for time, it is still worth a little 'drive through' the ares on your way to or from safari. Join in and write your own page! It's easy to do. How? Simply click here to return to Your Kenya Ideas.